I never met a flavor of fudge I didn’t like, but here’s one that really grabbed my attention — s’mores flavor fudge. This piece is from the candy store on Main Street in Disney’s Magic Kingdom. The idea seems so obvious, but I don’t have any tried and true recipes for s’mores fudge, which in this case is a layer of dark chocolate, a layer of graham crackers, and then another thicker layer of lighter chocolate with mini marshmallows. Disney’s tastes pretty good, but this is one that might be even better out of a home kitchen. If you have a S’mores Fudge recipe, I’d love to hear about it. Here are a couple of recipes I found on-line. 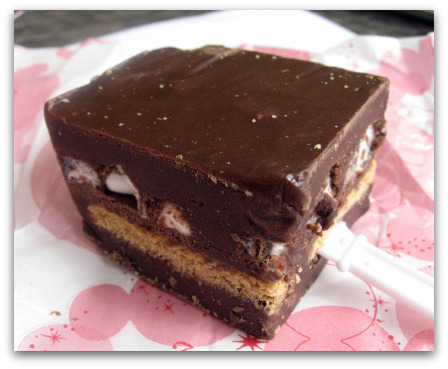 The first one that came up on a Google search was About.com’s s’more’s fudge. In this recipe, the graham crackers are crushed and mixed right in. Recipe Goldmine had a very simple condensed milk based s’mores fudge, which might be a good start. Another springboard might be a recipe for double layer or rocky road fudge. You just have to figure out a good way to add the graham crackers. I kind of like how the Disney fudge has a flat layer of crackers that divides the other two layers. I’m looking forward to experimenting with S’mores Fudge recipes in the upcoming weeks. Thanks Emma! Do you have some sort of insider information on Disney’s recipe????? If so, I’d love more, curious minds want to know ;). You may be right, but the fudge I had seemed to have two different shades to it. It’s hard to tell by the picture, but it did. Or maybe the top layer changed a little bit when they added the marshmallows to it? I thought the layers tasted (and looked) a little different. Looks so fun and great. And those cupcakes above—amazing!!! I think this should get priority over trying to replicate the Butterfinger Cupcake. 🙂 Also, it looks like the graham crackers are laid down so that fudge oozes up and down between the cracker pieces so there’s almost “mortar” to keep the layers together when it’s cut. From the photo, it appears they may even be individual crackers. Did you study it before you devoured it? I vote for S’moreos version! oh wow! this looks amazing, and you’re right, makes so much sense! I had been on a bit of a s’mores kick over the summer, I should give this a try! Looking forward to seeing what you come up with Anna! Holy hannah! This looks totally decadent! Gosh that looks good! Have fun experimenting!!! I’m not sure I like the idea of crushed grahams in there, but LOVE the idea and look of the actual crackers lined up in it. I was thinking of doing fudge as one of my things for my 1 hour presentation that I have to do at church, hmmm, I”ll really have to start thinking more. My theme for the presentation is Chocolate! Surprise! Hope you’re having a great time! Tell Mickey hi. Sam would be jealous. excellent idea! looking forward to what you come up with! That fudge looks delectable. I can’t remember how long its been since I’ve made fudge. It used to be a staple in my life, like every day!!!! My favorite is double decker chocolate peanut butter, with the chocolate layer an intense dark. Makes me want to make fudge again. WOW, Anna. The trials for this are going to be fun. A Snickers fudge recipe like http://desertculinary.blogspot.com/2005/05/snickers-fudge.html probably would be a good start too. I also like the idea of the solid graham crackers. I need to make something for the Master Gardeners on Tuesday. It was going to be Bacon Bourbon Brownies, but now fudge has my attention.